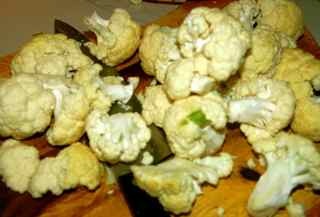 It seems lots of people have asked how to stir fry cauliflower Chinese way. I was very lazy last time — I only wrote about the simplest way of doing it ( Stir fry cauliflower and broccoli ). As I mentioned before, I have never been a cauliflower fan — Did I mention that cauliflower is called “vegetable flower” in Chinese? :))) Stir fry “flowers” sounds a bit strange to me … lol.. The first time I really enjoyed eating cauliflower was when, long long time ago, an Italian friend cooked it into lasagna — with lots of cream and cheese. I was surprised by its natural flavor — even when combined with all the diary products. But since there is normally no cream or cheese in Chinese stir fry , (I honestly cannot see myself putting pots of cream and blocks of cheese into a dish anyway:)), I tried to find a good Chinese recipe so that I could actually enjoy eating it when cooked Chinese way. 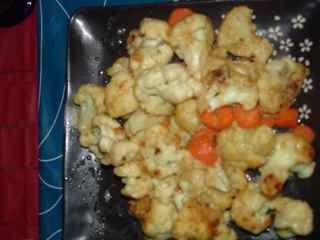 1) Wash and chop cauliflower and carrot into small pieces. 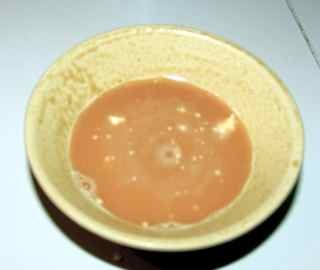 2) In a small bowl, mix 1 teaspoon of corn flour with water, then add in 2/3 tablespoon of salt, 1/2 teaspoon of white sugar, couple of drops of light soy sauce (optional), stir well. 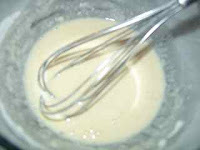 1) In a mix ball, mix an egg (egg white only is the best) and corn flour together into a thin paste. 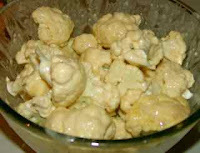 2) Evenly mix chopped cauliflower into the paste. 3) Place a wok on strong fire, then pour in oil for deep frying. 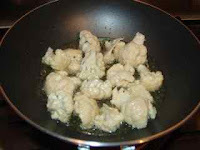 5) When the surface is getting “crispy” or the colour changes, remove the cauliflower pieces from the oil. 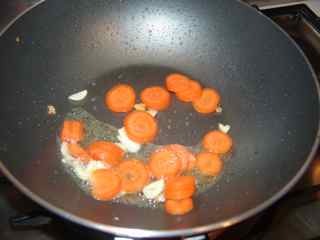 6) Leave a little bit oil in the wok, (on strong fire), add in chopped carrot, 1 tablespoon of cooking wine, stir a little, then add in fried cauliflower. 7) Pour in the corn flour mix, (stir well before adding in the wok). 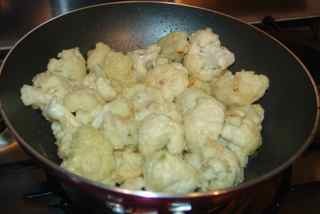 This might surprise you, but the oil absorbed by the cauliflower is hardly noticeable after frying. To the contrary, the taste is very fresh and light. Using corn flour in the ‘paste’ instead of ‘plain flour’ does make a difference as corn flour doesn’t form up a thick coating. Wash and chop cauliflower and carrot into small pieces. Add in ⅔ tablespoon of salt, ½ teaspoon of white sugar, couple of drops of light soy sauce and stir well. Mix chopped cauliflower into the paste. Place a wok on strong fire, then pour in oil for deep frying. When the oil is hot, put the pieces of cauliflower one by one into the oil to fry. When the surface starts getting crispy, remove the cauliflower pieces from the oil. Leave a little bit oil in the wok, (on strong fire), add in chopped carrot, 1 tablespoon of cooking wine, stir a little, then add in fried cauliflower. Pour in the corn flour mix, (stir well before adding in the wok). When the vegetables absorb all the sauce (this is very quick), turn off the fire, add 2 drops of sesame oil.